RNA binding proteins (RBPs) and formation of ribonucleoprotein complex. RNAs ability to interact with others RNAs and or proteins, such as miRNA-mRNA and lncRNA-mRNA interactions, plays an important role in posttranscriptional gene regulations [Bartel, D.P et al., 2009, Gong, C et al., 2011]. However, the global prevalence and dynamic of RNA interaction networks and their impact on gene regulation are still largely unknown. Such mapping of lncRNA structure and interactomes in different cellular states is crucial for our understanding of lncRNA biology. A transcript is usually considered as ncRNA, rather than protein, if it lacks any substantioal open reading frame (ORF), fails to produce a protein during invitro translation experiments or encodes short peptides from small open reading frames (smORFs) (Payre F et al., 2016). According to size of these ncRNAs, over than 200nt considered as lncRNAs. Thousands of these lncRNAs were identified by the recent advent of RNA deep sequencing and microarray data. To date, the detailed function of these transcripts remains unknown. 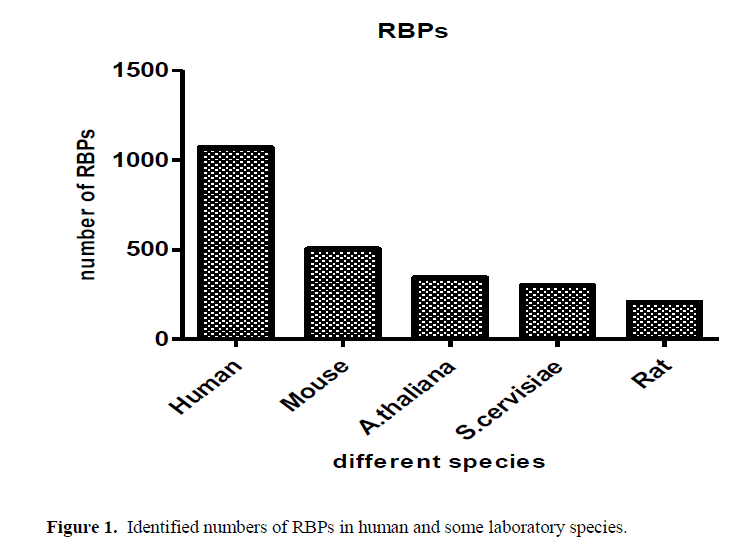 Figure 1: Identified numbers of RBPs in human and some laboratory species. Figure 2: Sequence alignment of a selection of The RNA recognition motif (RRM) domains for which the structure has been deposit in the PDB.The alignment was generated by the http://espript.ibcp.fr/ESPript/. The conserved RNP sequences are displayed in green. Table 1: The different properties of some RBPs domains. Proteostasis (protein homeostasis), is the process which govern protein cycle begin from biogenesis, folding, trafficking, activity, interaction, degradation and elimination. Proteostasis disruption can leads to disruption of all cellular functions and involved in many diseases, as aging and aging associated diseases as Alzheimer’s, Parkinson’s, and Huntington’s diseases (Powers ET et al., 2009, Balch WE et al., 2008) Following proteins; disruption of lncRNAs-homeostasis (lncRNAstasis) altered in cellular physiological and pathological conditions (see the comprehensive review demonstrating different lncRNAs disrupted in cellular senescence (A.R. Ghanam). So, like Proteins lncRNAs control cellular homeostasis in different levels from cell development, differentiation, migration in the embryo till programmed cell death or cellular senescence. It is clear now Proteostasis and lncstasis elicit the cell life and death decision. So that, there is overwhelming interest to explore the exact relation between Proteostasis and lncRNAstasis at both molecular level and phenotypic level. All cells take advantage of an array of quality control mechanisms to preserve the stability and functionality of their proteomes. Proteostasis involves mechanisms for the stabilization of correctly folded proteins most prominently, the heat shock family of proteins and mechanisms for the degradation of proteins by the proteasome or the lysosome (Hartl FU et al., 2011, Koga H et al., 2011). All of these systems function in a coordinated fashion to restore the structure of misfolded polypeptides or to remove and degrade them completely, thus preventing the accumulation of damaged components and assuring the continuous renewal of intracellular proteins. Additionally, chronic expression of unfolded, misfolded, or aggregated proteins contributes to altered homeostasis and predispose to some diseases . As the first shadow of lncRNA appears in molecular biology its involvement in this quality control mechanism. So, there is overwhelming interest to explore the relation between proteostasis and lncRNAstais. The foregoing discussion has provided a survey of the present state of knowledge regarding the role of lncRNA associated with Proteostasis in normal and disease conditions. LncRNAs and subcellular localization of proteins, some lncRNA regulates the abundance of proteins in different subcellular compartments. By recruiting transcription factors to the nucleus, specifically to certain regions of DNA, these lncRNAs can modulate transcription. Similarly, lncRNAs can recruit certain RNA binding protein into ribonucleoprotein complexes figure (3). Although the complete mechanism through which lncRNA affect protein trafficking and their impact on cellular homeostasis are largely unknown. Depending in their site of action, they may be divided into cis- and trans-acting transcripts. The cis-acting lncRNAs modulate expression of neighboring genes located in close proximity to lncRNA genic region on the same chromosome. In contrast, trans-acting lncRNAs regulates transcription of genes located on other chromosomes (Rinn, J.L et al., 2012, Guttman, M et al., 2012). Figure 3: A photograph illustrated the transcription of lncRNA from genomic DNA and the role of nuclear situated lncRNAs as histone modifications, DNA methylation, transcription and splicing of mRNAs. While the cytoplasmic situated lncRNAs control export of mRNAs, translation, degradation and localization of proteins. 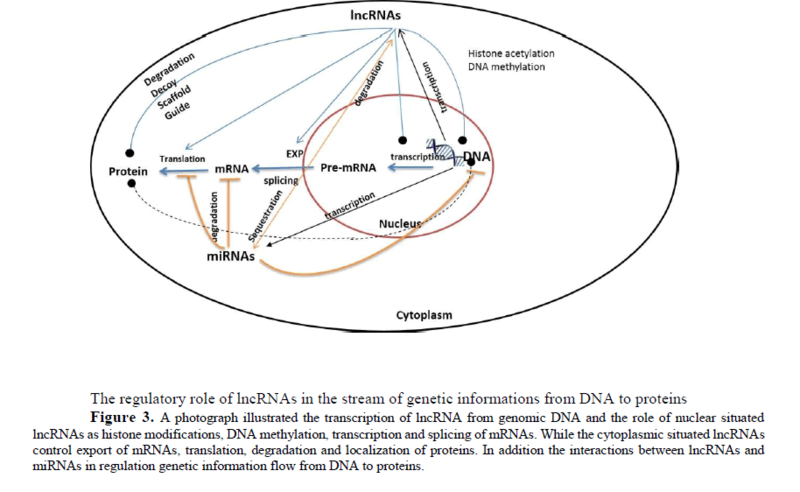 In addition the interactions between lncRNAs and miRNAs in regulation genetic information flow from DNA to proteins. The lncRNA pRNA interacts with DNA at the specific site for interaction DNMT3B to regulate rRNA transcription (Schmitz, K.M et al., 2010). In addition to that, PTENP1-asRNA alpha, inhibit transcription of PTEN coding gene by binding to DNMT3A (DNA methylase) at PTEN coding gene promoter and this complex is required for the deposition of repressive H3K27me3 chromatin marks at the PTEN promoter (Johnsson P et al., 2013). Moreover, PTENP1asRNA beta positively regulates PTENP1 mRNA post transcriptionally through PTENP1 sense (RNA-RNA interaction) and stabilizes it. The nuclear enriched transcript 1 (NEAT1) nucleates the formation of paraspeckles at its transcription site by recruiting paraspeckle proteins (PSPC1, PSF/SFPQ and NONO/P54NRB) either directly or in a complex and its continued expression is required to maintain paraspeckles, identifying the dynamic nature of this nuclear body (Mao, Y.S et al., 2011, Clemson, CM et al., 2009). However, Neat1 Knocked out mouse were viable and fertile they have characteristic loss of paraspeckles (Nakagawa S et al., 2011). Neat1 has also has epigenetic role as it repress gene expression by interaction with a number of chromatin binding protein/complexes in mouse embryonic stem cells including PRC1, PRC2, JARID1B, ESET and SUV39H1 (Guttman, M et al., 2011). The lncRNA TERC is essential for the telomere complex assembly formation which maintains telomere length (Lustig, A.J et al., 2004). The interaction of H19 with MBD1 to form ribonucleoprotein complex that recruit histone lysine methyltrasnferases to suppress gene expression. DNA double strand breaks (DSBs) occur in any given cell in the order of 10 to 50 per cell per day, depending on cell cycle and tissue (Vilenchik MM et al., 2003). DSBs are rare but it is highly toxic lesion requiring orchestrated and conserved machinery to prevent adverse consequences, such as cell death and cancer-causing genome structural mutations. DSBs trigger the DNA damage response (DDR) that directs a cell to repair the break, upon this DDR a number of lncRNAs-Protein complex plays a key role in the repair process. Among the already identified DSBs lncRNAs, the lncRNA PANDA that binds with transcription factor NF-YA. This complex lowers the activity of NFYA which interact with P53 the cell cycle key regulator and decreasing the activity of apoptotic genes (Di Agostino, S et al., 2006, Matuoka, K et al., 2000). In response to DSBs, the Ku80–Ku70 heterodimer associates with the broken ends, forming a clamp-like complex that recruits the DNA-dependent protein kinase catalytic subunit (DNA-PKcs) to sites of damage. Additional protein factors, including Artemis, DNA ligase IV, XRCC4, and XLF assemble with the Ku80–Ku70–DNA-PK complex and promote processing and ligation of the broken ends (Helleday T et al., 2008, Mehta A et al., 2014). The lncRNA LINP1 was found to serve as a scaffold linking Ku80 and DNA-PKcs, thereby coordinating the NHEJ pathway and enhance the repair process (Zhang, Y et al., 2016). The anchoring of the inactiveX chromosome, situated in the perinucleolar region during S phase maintained by ribonucleoprotein complex. The lncRNA Firre interacts with protein complex that includes CTCF, cohesion, YY1 and nucleophsmin not only to fix in active X chromosome but also to maintain its H3K27me3 (Yang F et al., 2015) (Yang F et al., 2015). Furthermore, XIST, a lncRNAs that is responsible for X chromosome inactivation in females, was shown to be declined in senescent cells (Umlauf DP et al., 2008, Sado T et al., 2013) but its specific function is still unknown. On the other hand, the staffing of translational repressors (RCK and FMRP) by the human lncRNAp21suprres the translation of CTNNB and JUNB mRNAs (encoding β-catenin and JunB, respectively) (Yoon JH et al., 2012,). Although β-catenin and JunB are known to influence cell cycle proliferation and progression the exact role of lncRNA-p21 is still obscure (Konishi N et al., 2008, Ye, X et al., 2007). The interaction of different a number lncRNAs with the well-known repressor proteins PRC1 and PRC2 acts as transcriptional repressors for different genomic loci. For example, ANRIL (Antisense noncoding RNA in the INK4 locus), interacts with both SUZ12 a component of PRC2 and CBX7, a component of PRC1, to accelerate epigenetic silencing of the CDKN2A/CDKN2B loci. Further, its down regulation increases expression of the cell cycle inhibitor P14,P15 and P16 (Kotake Y et al., 2011, Yap KL et al., 2010). In addition to that, the lncRNA MIR31HG interacts with both complexes PRC1 and PRC2 to repress P16INK4A expression (Montes M et al., 2015). The oncogenic lncRNA Focally amplified on chromosome 1 (FAL-1) interacts with and stabilizes BMI1, a PRC1 component, resulting in transcriptional repression of p21 (Hu, X et al.,2014). While the senescence associated lncRNA SALNR interacts with NF90, a nuclear protein that binds and prevents the biogenesis of senescence-associated miRNAs (Tominaga-Yamanaka K et al., 2012) and its over-expression of inhibits the localization of NF90 to nucleoli, which delays the onset of senescence (Wu, C.L et al., 2015). The molecular mechanisms for lncRNAs located in the cytoplasm have been less investigated. They may function as translation regulators via base pairing with their target mRNAs [60, 70] or may increase or decrease mRNA stability to affect protein expression levels (Faghihi MA et al., 2008, Kretz M et al., 2013). Another function for cytoplasmic lncRNAs is to regulate ubiquitination process or they control the passage of proteins or other RNA between the cytoplasm and the nucleus Figure (3). The lncRNA GAS5, acts a s a decoy of glucocorticoid receptor (GR) and prevent its mobilization from the cytosol to the nucleus thus repress GR mediated gene expression (Mourtada-Maarabouni, M et al., 2009, Lee, S.Y et al., 2012). The importance of P53 as a tumor suppressor is well exemplified by the estimated that it can drive around 50% of all cancers. It is subjected to exquisite control via multiple mechanisms involving array of interaction partners. One of such partners, the lncRNA MEG3 (Maternally expressed gene 3) induces accumulation of p53 protein, directly via RNA-protein association or indirectly by lowering MDM2 expression levels (Baldassarre, A et al., 2012, Tasdemir E et al., 2008). On the other hand, the highly up regulated lncRNA 7SL, interacts with P53 mRNA and suppress P53 translation. Another P53 partner, The RNA binding protein HuR can displace 7SL and enhance P53 translation. According to this competitive interaction, they can control cell cycle. As silencing of 7SL increased HuR binding to TP53 mRNA and promoted p53 translation, in turn enhancing cell cycle arrest and senescence (Abdelmohsen, K et al., 2014). The steady state of protein abundance in the cell is controlled by protein synthesis and degradation. Some lncRNA modulated protein levels indirectly by influencing the available pool of microRNAs and theryby affecting mRNA turnover and translation. For instance the lncRNA linc-MD1 and lincRNA-ROR acts as a decoy for miRNAs that usually suppress the translation or stability of other mRNAs (Wang Y et al., 2013, Cesana M et al., 2011). However, some lncRNAs interacts directly with mRNAs to enhance or suppress their translations or with proteins to modulate their half-life time. The lncRNA (AS Uchl1), enhances translation of UCHL1 (ubiquitin carbosy-terminal hydroxylase L1) through an imbedded SINES B2 present in AS Uchl1. UCHL1 is also, involved in brain development and age related neurodegenerative pathologies as Parkinson’s disease and its overexpression was associated senescence induction, likely due to increase production of p14ARF, p27KIPI and decreased production of MDM2 levels . The senescence up regulated lncRNA HOTAIR, enhances ubiquitination and subsequent degradation of Ataxin-1 (ATXN1) and Snurportin-1 (SNUPN) by acting as a scaffold for the E3 ubiquitin ligases Mex-3 RNA binding family member B (MEX3B) and DAZ interacting zinc finger protein (DZIP3) and their respective substrates  while, HuR promotes HOTAIR decay, and loss of HuR during senescence may contribute to HOTAIR stabilization and subsequent up-regulation (Wang,W et al., 2001). Notably, LncRNAs expression is strikingly cell type or tissue restricted and, in many cases, is even primate specific. Investigations of lncRNAs have demonstrated that they can serve as scaffolds or guides regulating protein-protein or protein-DNA interactions, as decoys that bind proteins or microRNAs (miRNAs), or as enhancers of gene expression when transcribed within enhancer regions or their neighboring loci. Thousands of lncRNA are expressed in human cells. The functions of most on these lncRNAs are unknown, but their expression can be highly cell type or tissue specific and many were deregulated either in physiological or pathological conditions to maintain cellular homeostasis. Further, the implication of majority of lncRNAs in diseases conditions as cancer, apoptosis, neurodegenerative diseases and senescence. As the already characterized lncRNAs identified in pathological conditions does these transcripts are functional in physiological conditions or not? Or does these lncRNAs are abundant in normal cell state? With the advent of sensitive high throughput genomic technologies, as microarray and next generation sequencing (NGS) a large fraction of the mammalian genome is likely to be transcribed, the characteristic and functions of overwhelming majority of lncRNA are cruuently unknown. Some of them are cytoplasmic others are nuclear, some are highly expressed others are barely detected. And functional studies indicate important role of several lncRNA, the majority of them a wait for further verification. In the last decade, the field of lncRNA becomes one of the fastest moving areas of research, which makes this the exciting time for the study on ncRNA realm. Long non-coding RNAs (lncRNAs) are associated to a plethora of cellular functions, most of which require the interaction with one or more RNA-binding proteins (RBPs); similarly, RBPs are often able to bind a large number of different RNAs. The currently available knowledge is already drawing an intricate network of interactions, whose deregulation is frequently associated to pathological states. Several different techniques were developed in the past years to obtain protein–RNA binding data in a high-throughput fashion. In parallel, in silico inference methods were developed for the accurate computational prediction of the interaction of RBP–lncRNA pairs. The field is growing rapidly, and it is foreseeable that in the near future, the protein–lncRNA interaction network will rise, offering essential clues for a better understanding of lncRNA cellular mechanisms and their disease-associated perturbations. However, only not more than a handful of lncRNA were identified, identification the interactions of the proteins/mRNAs that interact with lncRNA can the possible guide to predict functions of these lncRNA. At the present time we still have some limitations to identify the detailed functions of different lncRNA as lack of the exact protocol that can be applied for all ncRNAs, lack of conserved nature of most of lncRNA. By advancing in these areas of knowledge, we expect to gain a deeper molecular understanding of the exact role of lncRNA and the aura of lncRNA mystery will be gradually unveiled. At the same time, we can answer the following questions, does the interaction between lncRNAs and proteins is temporarily or controlled by the half life time of either lncRNA or protein? Is lncRNA acts as cellular thermostat and give the alarm when the cell hemostasis changed either under physiological or pathological alterations? Is the nature of this interaction is a kind of marriage between both? The possibility of the use of lncRNAs for therapeutic purposes through identification of their dynamic molecular functions at different cellular levels. Gong C and Maquat LE (2011) lncRNAs transactivate STAU1-mediated mRNA decay by duplexing with 3' UTRs via Alu elements. Nature 470(7333): 284-288. Wang X and Tanaka Hall TM (2001) Structural basis for recognition of AU-rich element RNA by the HuD protein. Nat Struct Biol 8: 141-5. Ramos A., et al., (2000) RNA recognition by a Staufen double-stranded RNA-binding domain. EMBO J 19: 997-1009. Rinn, JL and Chang HY (2012) Genome regulation by long noncoding RNAs. Annu Rev Biochem 81: 145-66. Guttman, M., et al., (2011) lincRNAs act in the circuitry controlling pluripotency and differentiation. Nature, 477(7364): p. 295-300. Matuoka K and Chen KY (2000) Possible role of subunit A of nuclear factor Y (NF-YA) in normal human diploid fibroblasts during senescence. Biogerontology 1: 261-71. Zamore PD, Williamson JR, Lehmann R (1997) The Pumilio protein binds RNA through a conserved domain that defines a new class of RNA-binding proteins. RNA 3: 1421-33. Helleday, T., et al., DNA repair pathways as targets for cancer therapy. Nat Rev Cancer, 2008. 8(3): p. 193-204.